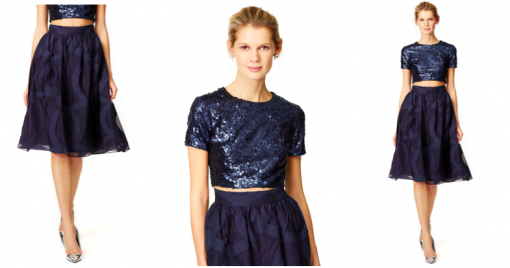 Published on December 8, 2014 in Christmas, Fashion, Gift Guide, Holiday and Stuff We Love. 5 Comments Tags: aran textured pom hat, asks, bed bath & beyond, boden, boots no7, c. wonder, chuck taylors, converse, corepower yoga, cut glass candle, gift guide for girls, gipsy young heart tights, gray malign iPhone case, harris sunglasses, jeweled flats, kimono, lip tease mug, love red lipstick, majestical jewelry, malbec, mecox gardens, muah matches, paper luxe, rent the runway, shopbop, silicone wrapped wine glasses, ugg women's slippers, voluspa, yoga classes, younique fiber lashes. 1 – GIPSY YOUNG HEART TIGHTS, ASOS, $11.37. How fun are these?? 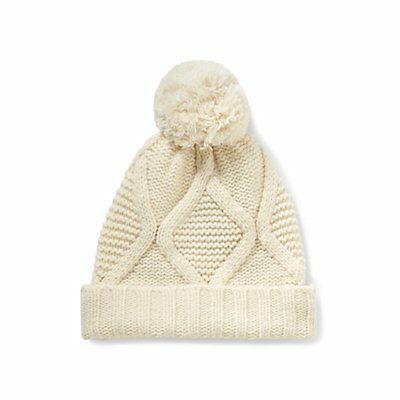 Lighthearted way to mix up her work wardrobe, or a perfect gift for your niece. 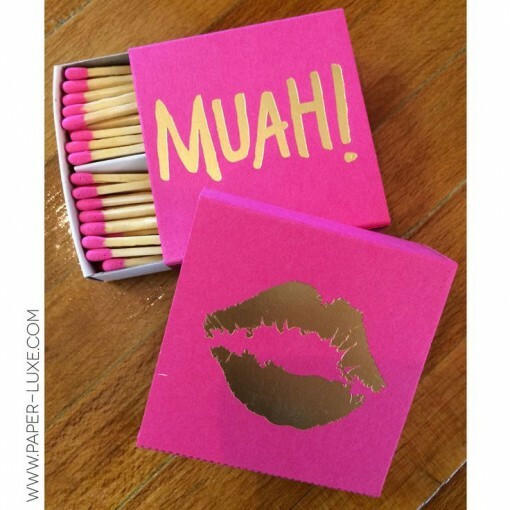 2 – MUAH! MATCHES, Paper Luxe, $8. 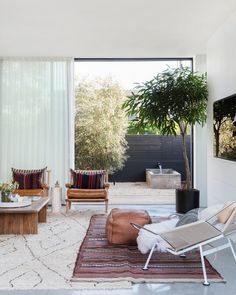 What a pretty pop for the coffee table! Or, let’s be honest… the back of the throne. 3 – BLUE GODDESS STATEMENT NECKLACE, Majestical Jewelry, $35. 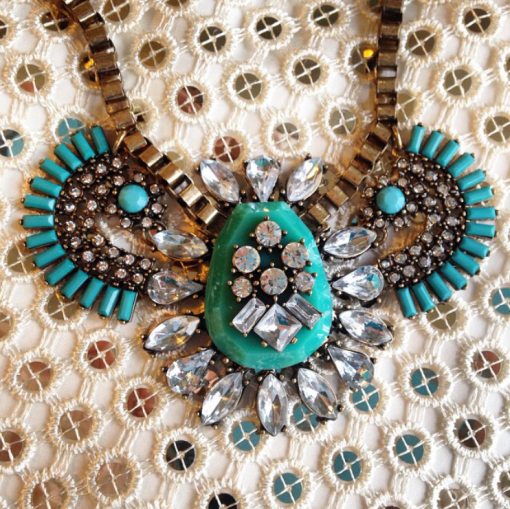 We love Majestical Jewelry for pimping out such jaw-dropping, J.Crew-esque statement pieces for Target prices. Note: the pictures they post on their Instagram page are usually a truer representation than what’s on the website, so make sure you follow them over there. It’s also where they do FLASH SALES, and you don’t wanna miss those. I have this one, Karrie has that one, and I accidentally just bought THESE during a flash sale on Instagram. 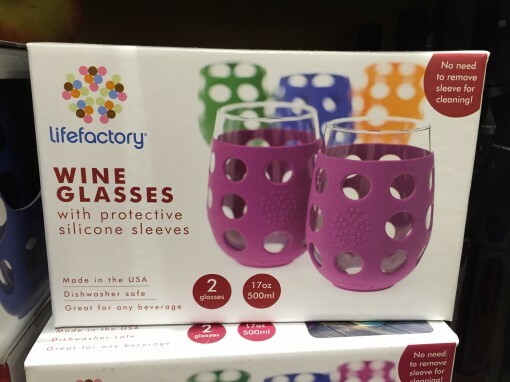 4 – SILICONE WRAPPED WINE GLASSES, Bed Bath & Beyond, $17 FOR SET OF 2. Um, omg. The answer to Bachelor/Bachelorette party Mondays! Do you think this would still have shattered if I’d hurled it at the TV during Juan Pablo McD-bag’s final epidsode?? On that note: make sure you read the blog every Tuesday morning after the show when I can’t keep my thoughts to myself and post recaps like this. 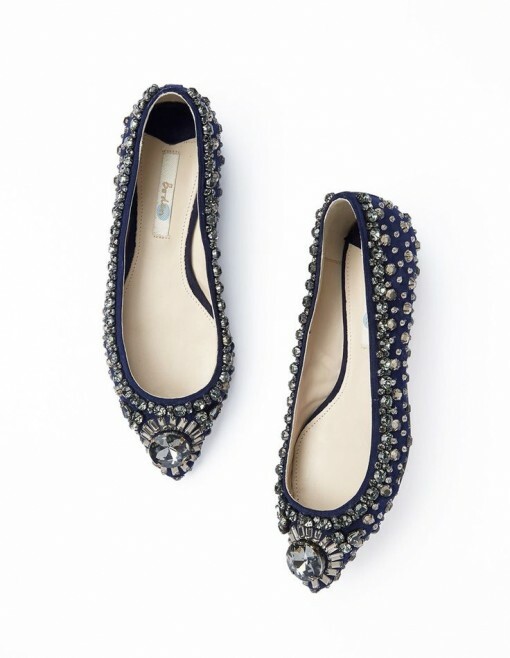 5 – JEWELED FLATS, Boden, $198. These are like the modern-day slippers that Cinderella left at the ball. I don’t know if they belong on my feet, or behind a piece of glass in a museum… Heaven. Also love ’em in gold. 6 – 3D FIBER LASHES, Younique, $29. I just started using this about a month ago after receiving an incessant amount of Facebook group invites to buy it… Everyone I knew seemed like they were having a Pampered Chef Mascara party online, and if you’re a female with a Facebook account, then you probably know exactly what I’m talking about. I’d also always loved my mascara and didn’t see the need to change things up… But I finally did, and I gotta tell ya – it’s pretty fab. I did one eyeball in the 3D Fiber lashes, and one eyeball in my old stuff… there’s no contest. My “old mascara” eye was a joke. This stuff gives you long, super luscious, doe-like lashes. Most days when I wear this, I don’t really feel like I have to put a lot of anything else on – just lip gloss. PS: when you click the link above to buy, there’s a quote on the right under a pic of me that’s standard on the Younique site, and I just wanted you guys to know that I’m not getting paid or having my arm twisted to talk about ANY of these items in this post… Karrie and I don’t roll like that. 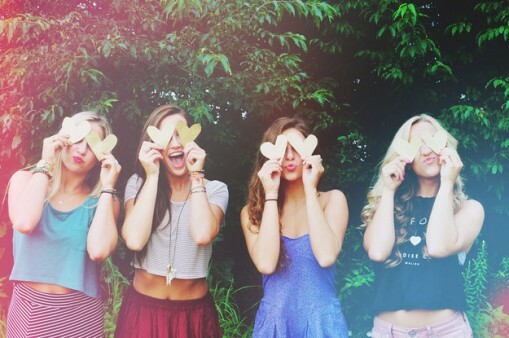 Everything on this blog that we recommend to you is ONLY on here because we love it. 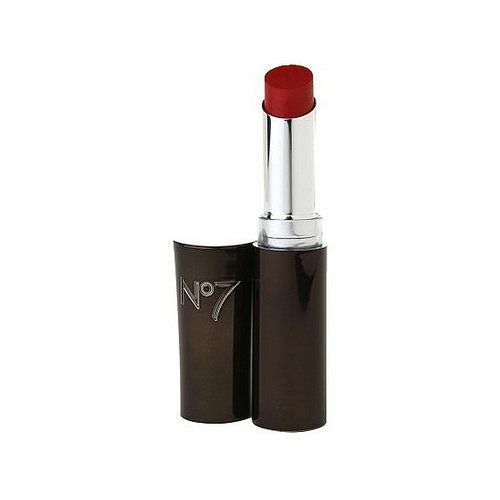 8 – LOVE RED, Boots No7, $9.99. Read my lips: this red is universally amazing on everyone I’ve ever seen it on. It also goes on super smooth and creamy. 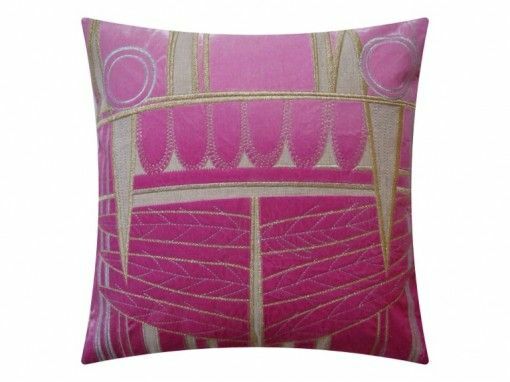 9 – ADAM + VIKTORIA PILLOWS, available through Mecox Gardens, call for pricing. 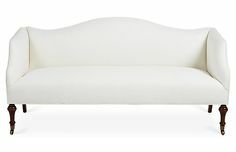 This one is the Edgar Candy Flos, but omg, they’re all stunning in person. Pricey, but the kind of piece she’ll keep forever. Velvet appliqué on linen. 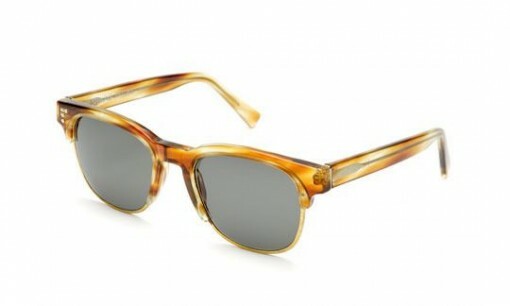 10 – HARRIS SUNGLASSES IN HONEYED TORT, Shauns, $305. These are an investment piece for sure… or better yet an “eBay saved search” item 🙂 Do you guys know that trick yet?? Whenever I find something I love that’s sold out, or that’s out of my price range, I set up an eBay “Saved Search” for it… then as soon as your item is listed, it sends you an email with a link to it – and it’s usually for a fraction of the retail cost. BANG. 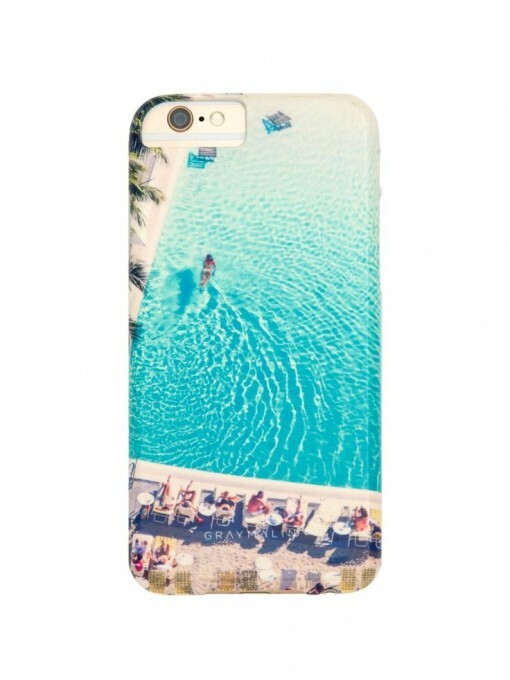 11 – THE SWIMMING POOL iPHONE 6 CASE, Gray Malin, $49. Le sigh. How could you not slip into a state of serenity every time you looked at your phone? It’s like being in Palm Springs… on a Monday morning in your office. 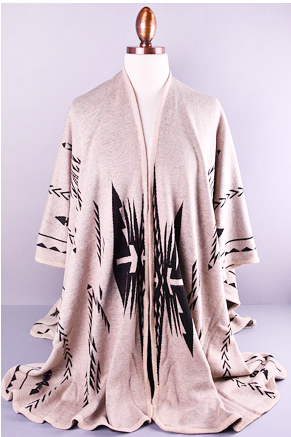 12 – TRIBAL PRINT KIMONO, Waverly Boutique, $54. I picked one of these up when Karrie and I were in Manhattan Beach a few weeks ago, and it’s the shizzizzy. Reminds me of this ditty we posted as an outfit suggestion last Thanksgiving… which is a perfect way to style it. 14 – YOU’RE PRETTY Malbec, Speak Wines, $25. If this isn’t the best hostess gift of all time, I don’t know what is. It’s like a wine/greeting card combo…. 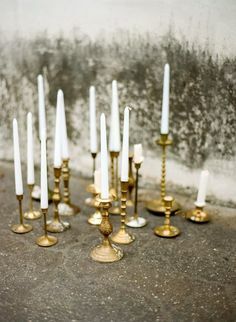 and it’s so pretty that no one will never want to throw away… and that is why Baby Jesus invented things like DIY candlesticks, so you can pop a taper candle in it afterward. 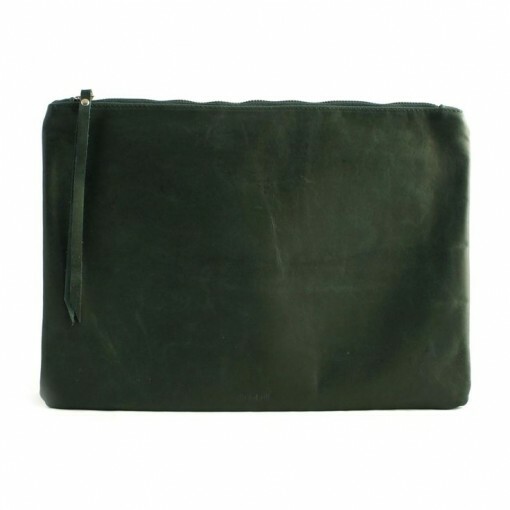 15 – XL LEATHER POUCH, Rib & Hull, $90. This showed up under my Christmas tree last year in tan, and it’s wonderful. Looks better with age, holds all of your girl’s garb, and feels like buttah. 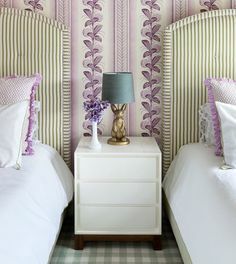 The green color is a gorgeous and sophisticated twist on the regular ‘ol neutral. 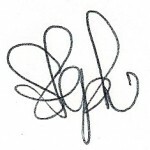 16 – RENT THE RUNWAY GIFT CARD. There was a time in our lives when Rent the Runway didn’t exist, and it was a cold, dark era in which we hope to never live again. RTR is an online service that provides thousands of gorgeous dresses and accessories to rent (for not that much dough!) The joy that RTR’s brought to our lives is hard to quantify, but let’s just put it this way: When you get someone a gift certificate to RTR, you’re gifting them the opportunity to feel like freakin’ Cinderella – and for next to nothing! Check out what WE’VE rented over the years, here, here and here. 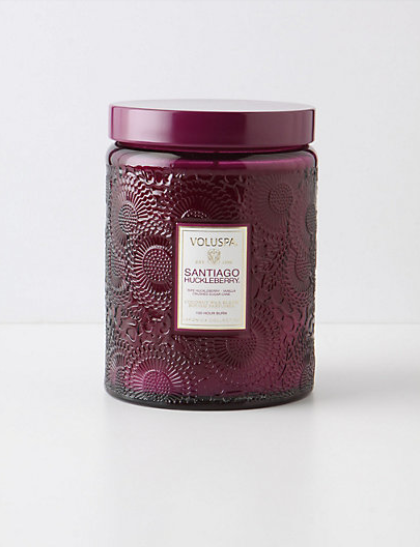 17 – VOLUSPA CUT GLASS CANDLE, $26. Every single candle in this collection has THE most heavenly scent, with Goji Tarocco Orange being our personal fave. It’s the perfect gift, not just ’cause it makes one’s casa smell like a peaceful sanctuary, but because it comes in the prettiest, girliest jar. 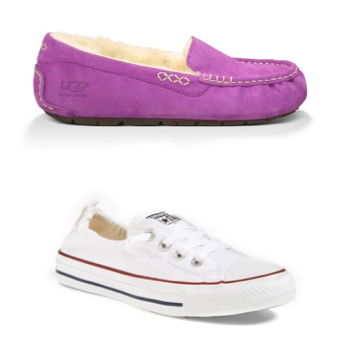 18 – UGG WOMEN’S SLIPPERS IN IVY, $100 and SLIP-ON CHUCK TAYLOR ‘SHORELINE’ SNEAKERS, $45. Two different kinds of comfy kicks, and both so cute. Those Uggs Ansley Mocs are so girly, they make me squeal a little. And the Chucks, well, they’re totally classic and go with everything (no, really) and did we say they’re slip-on?! Making your girl’s life about 23 seconds easier. 19 – GIFT CERTIFICATE TO YOGA CLASSES, priceless. There’s no getting around what yoga can do to the body and the psyche, so why not bequeath those benefits to one of your girls who could really use them? The two of us are huge fans of Core Power Yoga (Amy P. in San Diego – we worship at your altar), but we’d bet a pretty penny there’s a yoga studio in any ol’ town these days. That’s it for now – and be sure to keep following us on Instagram and Pinterest for more gift giving ideas! 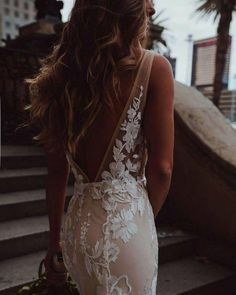 Karrie – Pinterest | Instagram and Steph – Pinterest | Instagram. 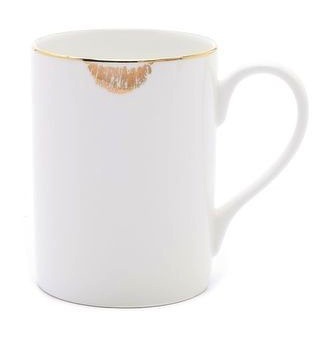 I think I’ll buy the mug. so cute. Thank God. Or rather, thank you, Karrie and Steph!! These gave me some great things to grab for my wife.